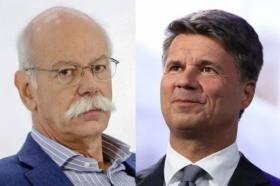 Daimler CEO Dieter Zetsche and BMW CEO Harald Krueger have both signaled lower profits this year. FRANKFURT/MUNICH -- Daimler AG and BMW AG are considering joining forces on making key automotive components, a move that would tie the traditional luxury-car rivals more closely than ever before and reflect the fundamental changes sweeping the industry. The German manufacturers are exploring options such as joint vehicle platforms, batteries and autonomous-car technology, people familiar with the matter told Bloomberg. Collaboration would be restricted to technology that’s not brand-specific, but deliberations are in their early stages and the timing of any decisions are unclear, the people said. Daimler and BMW declined to comment. Joining forces on automotive technology would significantly deepen Daimler and BMW’s existing cooperation efforts. The German manufacturers already work on components purchasing and bought digital-mapping company HERE Technologies for 2.5 billion euros ($2.9 billion) in 2015 together with VW's Audi. This year, the pair agreed to combine their respective car-sharing platforms Car2Go and DriveNow -- a deal which received regulatory approval in the U.S. on Wednesday. The merger of their mobility operations includes plans to add other services and has boosted prospects for more initiatives, the people said. Relations had soured last year after allegations surfaced that German carmakers had potentially breached antitrust regulations in Europe. The ongoing probe into suspected collusion between BMW, Daimler and Volkswagen may complicate new cooperation projects, one of the people said. Given the complex nature of product and technology cycles, the eventual payoff from a partnership could take years to realize, the people said. Building new cars can involve decade-long planning, making cooperation notoriously difficult. In 2013, General Motors sold its stake in PSA Group after failing to find savings through joint purchasing and product development, while an alliance of Volkswagen and Suzuki Motor Co. broke down in 2016.